People sit inside a local restaurant displaying posters for Guinea’s incumbent President Alpha Conde, in Conakry, Guinea, Oct. 17, 2015. Guinea's incumbent President Alpha Conde won the country’s second democratic election, but Guinea’s opposition parties have rejected the results and called for demonstrations. Bakary Fofana Fofana, the head of Guinea’s Independent National Electoral Commission, announced President Alpha Conde’s re-election victory late Saturday. Fofana said before the constitutional court’s final validation of the results, the electoral commission proclaims Conde as the winner in the first round of voting held last Sunday. Before the results were announced, Guinea’s main opposition leader and former Prime Minister Cellou Dalein Diallo announced he and the six other opposition candidates would reject them. FILE - Guinea's leading presidential candidate Cellou Dalein Diallo at the People's Hall in Conakry, Guinea, Sept. 21, 2010. The candidates last week claimed widespread fraud in the voting. International observers have said the vote was free and fair, but they did criticize the electoral commission for poorly organizing the elections, saying some people waited hours to cast ballots. 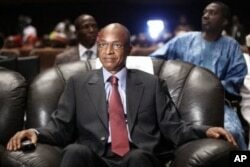 In his statement, Diallo said he would not appeal the results in the constitutional court. He instead called for peaceful demonstrations. About 12 people died in violence in the run-up to the polls. The streets of the capital Conakry were calm Sunday. La Source University in Conakry professor Sori Diakite called for Diallo to seek recourse in the courts if he feels the vote was fraudulent. Diakite said the same law that allows for him to march in the streets allows for him to file a complaint at the constitution court. As for Conde, he has his work cut out for him, Diakite said. Despite being home to stores of valuable minerals like bauxite and iron ore, about half of Guineans live in poverty. The people of Guinea have been waiting for a lot of their problems to be fixed, Diakite said. There is the problem of water, and the problem of electricity, although he said there has been some improvements in that. He also cited the problem of unemployment. Candidates have eight days to file complaints with the constitutional court before it certifies the results. Karim Kamara contributed to this report from Conakry, Guinea.